We’ve already seen pictures of cases supposedly designed for the Samsung Galaxy S10 Plus, but now we’ve also seen a video of them giving a good indication of the size of the phone. Shared by reputable leaker Universe Ice, the footage shows a Samsung Galaxy S9 Plus, Samsung Galaxy Note 9 and Oppo Find X being put into a case apparently designed for the S10 Plus. The Samsung Galaxy S9 Plus fits quite neatly into the case, other than a cut-out likely for a headphone port on the top edge, and the rear camera, which is vertically stacked on the Galaxy S9 Plus but looks set to be horizontal on the S10 Plus. The 6.4-inch Samsung Galaxy Note 9 on the other hand is significantly too large for the case. However, this doesn’t necessarily mean that the Samsung Galaxy S10 Plus has a smaller screen than that phone, as it’s rumored to have smaller bezels and a 6.4-inch screen of its own. Indeed, the 6.4-inch Oppo Find X does fit into the case, so it looks likely that the Samsung Galaxy S10 Plus will have a screen of around the same size as the Galaxy Note 9, packed into a body roughly the size of the 6.2-inch Samsung Galaxy S9 Plus. As ever, we’d take this with a pinch of salt. After all, the case could easily be designed for a different phone or simply built based on inaccurate specifications, but it makes sense that Samsung would be able to fit a bigger screen in a similar size body to the S9 Plus if it shrinks the bezels. 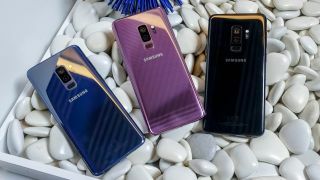 We should know all the official details about the Samsung Galaxy S10 Plus – along with the standard Samsung Galaxy S10 and potentially one or two other models – very soon, as the range is likely to land at MWC 2019 in late February.